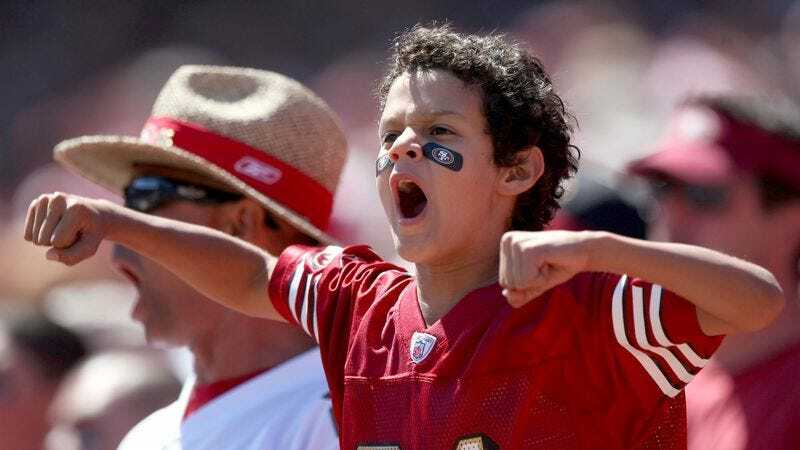 TEMPE, AZ—Excited by Arizona’s surprising 2-0 record and expressing confidence that the Cardinals will have “the best season ever,” 7-year-old Jonathan Burley appeared completely oblivious Saturday to the inevitable agony and disappointment he will soon face as a fan of the team. “We’re going to win the Super Bowl this year!” said Burley, apparently unaware that the Cardinals will, at best, have a 3-6 record heading into their bye week after losing several close games through last-minute turnovers, avoidable penalties, and botched clock management. “Kevin Kolb is the best quarterback, and Larry Fitzgerald runs so fast. They’re going to score a million touchdowns tomorrow!” At press time, Burley was trying on his new Beanie Wells jersey, failing to realize that the running back will tear an ACL during Sunday’s game against the Eagles and finish the season on injured reserve.